It is not unusual to find a woman on a tractor in the South and especially here in Cannon County by no-means. You can see them on their green John Deere’s or the red Massey Ferguson and maroon Farm-all; you also might see them on a red belly ford or a gray Ford 8N. But I bet it would be far and between to see a PINK tractor. Meet Carole Johanson of the Braxton Community, where her farm house is on land that used to be a part of Tamarac Acres, between the horse barn and Braxton Farms. Carole has lived all over the United States and says that Cannon County is a place she wants to stay. Carole maintains her mini farm for hay. I first met this woman when I joined the American Legion Post #279 here in Woodbury. She was a member of the Legion from another state and had come to have her membership joined with that of the Post here. I found her to be a straight-forward person who had served her country in the Army Nurse Corps, from 1967 to 1970, during the Vietnam War. I found her to be very approachable. In short, I liked her. Carole has friends up in Colonial Williamsburg, Virginia at the Office of Planned Giving who had heard from her about this pink tractor and wanted her to send them pictures of her tractor. “They all think it is a hoot,” said Carole. 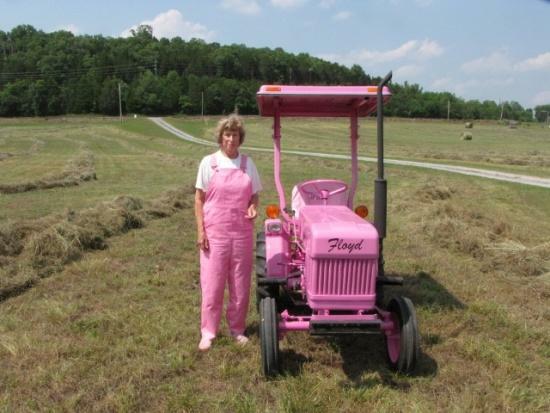 When I heard about the pink tractor I thought I would like to see it for myself. It is a neat tractor, and it is a genuine Ford Tractor made in Spain. On the front of this pink tractor is the name “Floyd,” the name is written with the same kind of script that the Ford Motor Company uses on all their products. I asked her why she would have painted her tractor pink and she told me there were two reasons for this color. First, her favorite color is pink, and secondly she wanted to protect it from being stolen. What? Stolen I asked; and she informed me she had a very nice trailer that had a hydraulic lift and dump system on it and someone actually backed up to her storage area and stole it. She told me that she replaced her trailer and it will now be painted hot pink, like the tractor. As you can see in the picture Carole is also wearing pink overalls which she made herself. She actually makes almost all of her clothes, and she is also a woodworker with her shop being located in her basement; something, she says, is a great hobby. She has made several pieces of furniture and cabinets for her own house. Carole belongs to two donor societies in Williamsburg, Virginia. “Joe and I always attended those annual meetings in period correct costumes that I hand-made,” Carole adds. The tractor is now nestled between a front end loader and a 6' finish lawn mower, both of which get used a lot. “Pink Floyd is not just Pretty Boy Floyd, he works,” says Carole. If you are out on the road and you see a pink dump trailer being pulled, pay attention and see if she is driving it, if not call the Sheriff, I know she would appreciate you. I love it!! Thank you Carole for your service to our country! I was just a baby during the Vietnam war, but I realize that most troops were treated badly when they returned. I absolutely love the pink tractor and the name!! That is so awesome!